Our friendly, knowledgeable dispatchers make sure you get the right mix and the amount you need for your pour when you need it. We recommend placing your order 48 hours in advance. Day and time of delivery. Delivery times fill quickly; please place your orders 48 hours ahead of time. Project location and address, town or city, including the nearest major street or intersection and lot number or building number if a new construction. Job site contact name and mobile phone number. Quantity required or job dimensions. Call our dispatchers or use our concrete calculator to help to determine how much concrete you will need. Be sure to make a 10% allowance for uneven sub-grade, spillage, etc. and round up to the closest ¼ yard. How you are unloading the concrete (chute, wheelbarrow, power buggy, concrete pump, etc.). Extra building supplies. We offer re-rod, expansion joint, concrete colors, curing and sealing compounds etc. Will Call means you intend to pour but order will not be shipped until it is confirmed by telephone as a “Firm”order. Firm Order means it will be shipped at the specific time unless it is cancelled at least 90 minutes before your scheduled time. Weather Permitting will only be shipped if there is a positive weather report. A "Rain or Shine" order will be shipped without confirmation, but will be held if there are severe weather conditions that affect the safety of the driver and our operation. 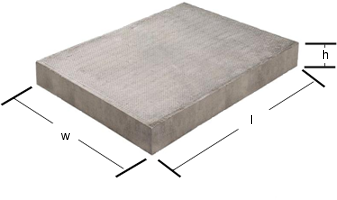 Refer to the concrete calculators below to determine how much concrete you will need.